Our brass lessons include private trumpet lessons, french horn lessons, trombone lessons and tuba lessons. 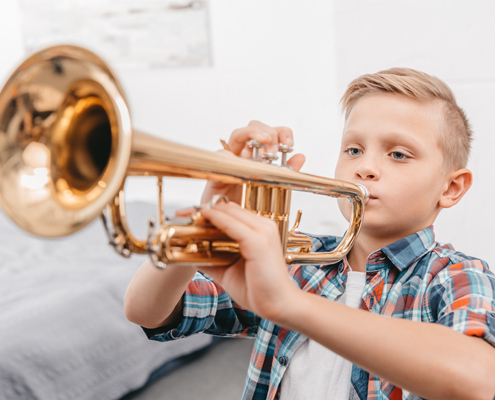 We recommend that students be at least 9 years old before taking up a brass instrument. Lessons are once weekly for 30, 45 or 60 minutes. Our trumpet and brass teachers are highly skilled and dedicated to helping you reach your musical goals. Students will learn proper embrochure, technique, note reading, theory and more in addition to working on music of their choice. We work with students of all abilities and can handle everything from a beginner starting 5th grade band up to an advanced student that is preparing for OMEA or a college audition. WHY CHOOSE US FOR Trumpet LESSONS? Trumpet lessons are first come, first serve so contact us today to arrange your first lesson!